Mitchell Yass, "The Pain Cure Rx: The Yass Method for Diagnosing and Resolving Chronic Pain"
Are you struggling with chronic pain? You're not alone: an estimated one billion of us across the globe suffer chronic pain every day. And what Dr. Mitchell Yass has found over his 20-year career is that many of us suffer needlessly. While the current medical model for treating pain isn't helping, there is hope. 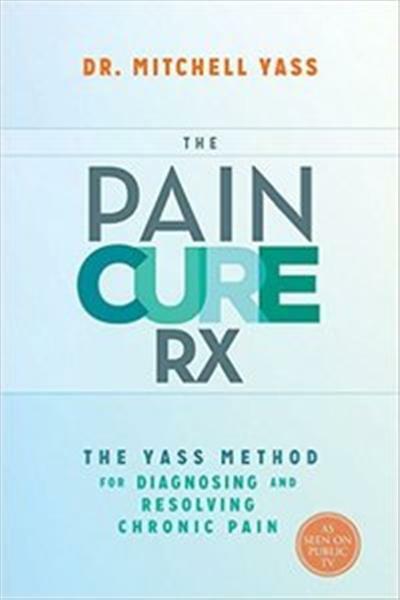 The Pain Cure Rx presents an alternative model of treatment – the Yass Method – that can resolve pain quickly and effectively without surgery or medication. In the medical community today, most chronic pain is attributed to a structural problem, such as a herniated disc, a meniscal tear, or arthritis. But Dr. Yass has found that in about 90 percent of cases, the cause is actually a muscular weakness or imbalance – a condition that's easy to treat on your own. The Yass Method, developed through his work with more than 14,000 patients, focuses on finding the true source of the pain and then using simple exercises to find lifelong relief. Dr. Yass looks at the most common areas where people experience pain; lays out simple tests that examine things like range of motion, walking patterns, and posture; and teaches you to use this information, rather than invalid diagnostic tests, to determine whether your pain is muscular or structural. If it is structural, you can choose surgery, knowing that the outcome will likely be good. But if the pain is muscular, you can use the easy, step-by-step exercises and routines Dr. Yass offers to get the pain resolution you're searching for. Many of the people Dr. Yass has treated came to him as a last resort before surgery or as a follow-up after surgery that didn't resolve their pain. Many of them had been told that they would have to manage their pain with drugs for the rest of their lives, or, worse, that there was nothing left to try; they would simply have to live with the pain. This revolutionary book shows that, in most cases, this simply isn't true – and empowers you to create a pain-free life.